Today’s wreath is brought to you by the Target dollar section, the President’s Day Sale at Joann and the letter “G” for green. Step 1: Get the supplies. I picked up these $1 vintage-esque glitter glasses from the St.Patrick’s Day section within Target’s dollar bins. I grabbed a bunch, but you can use as many or as few as you’d like. I then went to Joann and picked up a wire floral wreath form and some Shamrock wire wrap, conveniently half off for President’s Day. Step 2: Start wrapping. Not much to this- just secure the wire on the form and begin to twist around. I used one entire package of wrap to coat the wreath. Depending on full you want the metallic bits to look, you’ll probably need to pick up another roll of wire. I had a few, and this was important since I used the extra roll to secure my glasses onto the form. TIP: I cut the original coil into about five long-ish strands so that it was easier to wrap around the wreath. Those metallic shamrocks can get everywhere and be a pain to wrap! Step 3: Cut a few pieces of small wire to secure the bows of the glasses. This makes it easier to keep the glasses secured to the form as well as easier to work with. 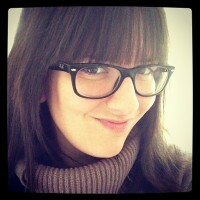 Step 4: Start attaching the glasses. I threaded a long piece of wrap through the wire form and wrapped it several times around the bows and the wreath. 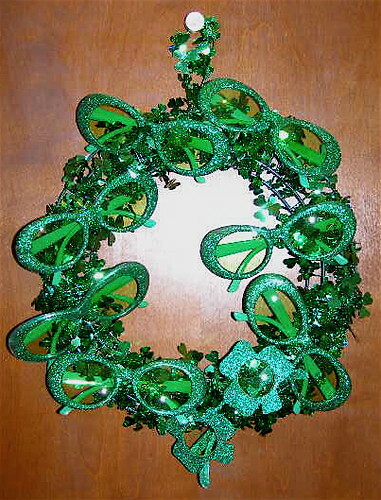 Depending on how you’d like the glasses to lie on the wreath, you can make them bunch together, hang to the sides, etc. Once you start placing them, you’ll get an idea of how to make the glasses stay nice and firm to the form. Step 5: Using another piece of wire, attach a loop to the top for hanging. Very flashy! Can’t wait to see what you do next! love this! i featured it this afternoon over at craft and found as a great St. Patrick’s Day tutorial!